I have come up with another that has helped me to increase my general output. Recently and throughout much of my adult life I have been in a position where my work and learning had to been self driven. So my inputs and outputs were purely based on my motivation and willpower. Even though things have progressed smoothly so far, this realisation still remains. Only through focus and consistency will my desires and goals, bear their fruits. Being broke isn’t okay anymore and as much as I’m able to live off the minimal and still enjoy the comforts of modern life.. would prefer it to be a choice, not a permanent condition. The truth is, we humans can become lazy and mediocre by default. When your basic needs are met; water, food, shelter and a warm bed, you’ll realise that you’re suddenly less driven. And as much as you’d like to improve your circumstance and reach your desires, it’s easier to do little and idly dream (procrastinate). Therefore, it comes down to building habits, rituals and structure. By creating an environment that makes you push yourself and do what needs to be done. And the best way to do that, I have found; is to track my hours worked as if I was employed. Draw up yourself a table, like the one below. And start tracking. It’s that simple.. You can use Google Sheets or any other alternative software of your choice. Just don’t get too OCD about the exactness of time being tracked, because that can turn into a slippery slop into insanity. 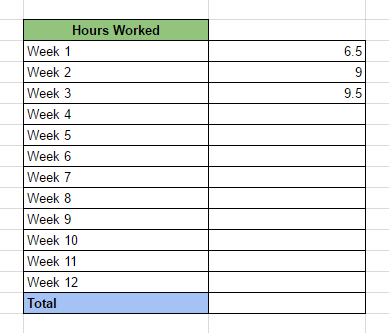 Adding up the total hours worked per week, in this case work can be anything you define as productive. And track them against each week and month. As you may have figured, every now and then you reach a new high score, which creates a gamifying effect. Mentally you begin to compare the currents weeks performance against your best and once it a while you’ll beat your highest score. Based on experience my best and most productive hours are between 10am – 2pm meaning 4 hours of productive work per day and 28 hours of productive work a week, if I manage to work everyday. Seems great in theory but so far the highest I’ve achieved is 15, there is definitely room for improvement. So there is the goal. The correct amount of discipline & focus will surely make it attainable..
Update: the highest is now 20.5 hours but was due to a week of paid freelance work. Getting closer. Hope you’ve enjoy this quick read, feel free to sign-up for my email updates on related topics. And of course, as always, share this with your friend and foe.